Should West be worried by Russia naval moves? Editor's note: James Kraska is professor in the Stockton Center for the Study of International Law, U.S. Naval War College. The views expressed are his own. Just as Russian ground forces have moved into Ukraine, in recent weeks Russian air and naval forces have conducted a handful of high-visibility deployments throughout the oceans and airspace of the global commons. Should the West be worried? Generally, these operations comply with the international “rules of the road” at sea and in the air, and are in compliance with international law. All nations are entitled to freedom of navigation and overflight in the global commons. Thus, the deployments should be seen as great power theater, rather than as a violation of international law. Yet they also dispel any doubt that we now live in a tri-polar world, with a revanchist Russia and China bent on upending the U.S.-led global order in Europe and Asia, respectively. Russia, for its part, is using its naval power to underscore the nation’s relevance and global reach. Indeed, this month Russia pledged to expand its forays into the Caribbean Sea and the Gulf of Mexico. The announcement follows an incident in June, when two Russian strategic bombers, bristling with intelligence-gathering electronics, came within 50 miles of the coast of California. Since the eruption of war in Syria, Russia has added at least four warships, a spy ship, and a repair ship to its forward operating base in Tartus, Syria, as part of its new standing Mediterranean Task Force. Even more interesting, the Russian cruiser Varyag led a four-ship flotilla to waters off northeast Australia during last week’s G20 summit in Brisbane. After HMAS Parramatta led three Royal Australian Navy warships and maritime patrol aircraft to monitor them, Russia explained that the flotilla was testing their range capability, “in case they have to do climate change research in the Antarctic,” and that the ships could, if necessary, protect Russian President Vladimir Putin, who attended the summit. Rear Admiral Anders Grenstad stated that while the mysterious craft could not have been a submarine, the incident resurrected comparisons to an incident in 1981 when a Soviet submarine ran aground and surfaced just two kilometers from the main Swedish naval base at Karlskrona. Russian strategic reconnaissance bomber flights reportedly fly near Japan more than 100 times a year, sometimes overflying the entire length of the island chain from Okinawa to Hokkaido. These patrols unnerve the Japan Self-Defense Force, which sends aircraft to intercept them. In each of these cases, Russian naval and air forces serve as the tip of the spear for Kremlin diplomacy. Common threads run throughout each deployment. First, Russia is reaping past investments in naval force structure. Last year, the country reportedly added 36 ships to its inventory, allowing the Russian navy to replicate its worldwide operations of the Cold War. In Russia’s view, the deployments are a return to normalcy. Second, the deployments are designed to convey to the world that Russia is a nation of global consequence, with the ability to project power in any region. With the Russian Federation headed for demographic ruin in the coming decades and the nation’s one-trick economy wholly dependent on the sagging oil and gas market, Russia desperately seeks to revive the trappings of its former glory. Third, in contrast to Russia’s invasion of Ukraine, which undermines the core proscription against armed intervention in the United Nations Charter, Russia’s naval and air deployments are entirely consistent with international law, and in particular the United Nations Convention on the Law of the Sea (UNCLOS). The navigational rules set forth in UNCLOS reflect customary international law and are binding on all nations. Ships and aircraft of all nations, including warships, submarines, and military aircraft, are entitled to exercise high seas freedoms beyond any coastal State’s 12 nautical mile territorial sea. The only limitation on these operations is that they must be “peaceful” under the U.N. Charter in that they cannot unlawfully use or threaten the use of force. Within 12 miles, ships – but not aircraft – may transit in innocent passage, a much more restrictive rule than the UN Charter. The uptick in Russian air and sea operations is a reminder that the principle of freedom of navigation in the global commons entitles all states the unimpeded use of the oceans and international airspace. Next entry »Is Russia cozying up to China? Lol huffin paint again? Too funny! Gay was a typo you nitpicker. Lol there you go! Standard operating procedure huh? Run forest...run! No. Been working hard lately and going to bed early is all. Nice try though. Awe. What should we name him, George? He looks like a little plastic flower. That settles it! His name shall be Blue Saffron. Not Sue as previously thought. What! The ruskies have boats?.Mom? Grab your things. We're moving into the wine cellar. Lol @ Philip @ 3:52 am are you sleepwalking? You mustnt take Ambien while drinking...people have been known to do and say some peculiar things when combining the two! 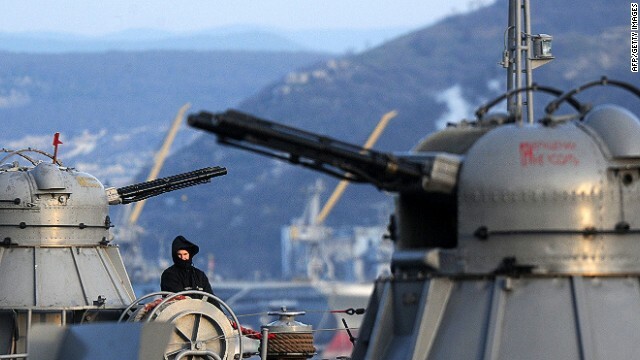 Should the West be "worried" above Russia's naval moves? Of course not! Just another scare tactic from the right-wing thugs in Washington as usual. @ Joey in black, scare tactics from Putin you mean. And maybe it does need consideration since Russia is coherting with Iran on nuclear arms. Keep your friends close and your enemies closer dont ya know. But Russia is Not my enemy, chrissy nor yours. That is just a lot of right-wing blah-blah-blah! Don't fall for it! Lol @ Joey in black, i dont trust any politicians for the most part. No matter which country they are politicing for. They ALL have agendas and it isnt usually FOR the common folks . putin fr nato and USA. I just have a few things I would like to say. The idea that it had to have been a russin sub in swedish waters came from the media, not from the swedish government or the armed forces. What the govenment and the armed forces have said is that a foreign minisub violated swedish waters, however they have been very clear that they cannot say where this this minisub came from. As a swede I am not worried about russia, we are a small allience-free nation and as such it is not in russias interest to invade. I would not be shocked if it turns out that what russia wants is for sweden to boost it´s own defence. Let me explain, a swedish people that feels confident that it´s armed forces can defend the kingdom is less likely to desire a swedish NATO-membership. However, if the people feels that the armed forces cannot do this then the support for NATO-membership rises. God willing, Sweden will never joint that most unholy alliance (NATO). Besides, no country, Helena, least of all Russia, poses any kind of threat towards Sweden. I for one wants Sweden to remain alliance-free, we have been so for the past 200 years and for the past 200 years the country has not been at war. There are people who say that one should be afraid of Russia because Russia has been an enemy to Sweden historicaly. Well, sure Russia has been an enemy of Sweden historicaly, however, so has Denmark and Polen. In fact, Swedens enemy no.1 historicaly has been Denmark, not Russia. Besides, you will never see the day when Sweden enters NATO unless Finland does so as well, and you will never see the day when Finland enters NATO unless Sweden does the same. Sweden and Finland are linked by the historical fact that we were one kingdom for about 700 years, until the year 1809. Now that Russia has stolen Crimea and eastern Ukraine, maybe it's a good time to have a cease-fire. Russia has already gotten what it really wanted in the beginning ...Crimea for its warm water naval base and off-shore oil reserves, plus lots of newly acquired Russian businesses. Now it's time for Russia to talk cease fire to get the crippling sanctions removed??? That's all they want ...for now!!! Russia's main reason for sending in the unmarked Russian troops into Ukraine were to make sure they were in position to have the vote they knew they would get to make Crimea a part of Russia permanently. Putin has long wanted this area, as it is Russia's only warm-water naval base in the world and he has always thought this was a part of Russia, even though it depends on who you ask! Sure there is and was a lot of ethnic Russians living her, but that has been the plan for years and for multiple reasons. Valuable real estate, nice location, strategic location militarily and a place to make sure was always in Russian control. This didn't just happen with the annexation of Crimea, but has been in the works for a long time! Is this annexation a permanent thing ...only time will tell!?!?! ?